What Does it Mean to be a Captain? What does a Soccer Captain Do? When young kids dream of making it to the top as a soccer player, many also dream of being their team’s captain as very often they are seen to be the most important player in the soccer team, but is that really true? What does it mean to be a Captain? In truth there are some people do not see the role of the soccer Captain to be as important as their equivalent in other sports who may actually have more hands-on roles within the team. For instance, there are other sports where the captain actually calls the plays during the game and whilst this is not really the case in soccer it would still be wrong to think of it merely as a ceremonial position reserved for somebody who shakes hands at the start of the match and collects the trophy at the end of the season. If this was the case, then soccer Captains could be chosen at random with little thought put into the process but in fact coaches will put a lot of thinking into who they think will make the best Captain. Decide which goal to kick towards first. Surely any member of the team can do these things? Very often though a Manager wants their captain to rise above these mundane tasks and be a talismanic figure, the person who best embodies the character of the team and demonstrates all the qualities that the coach wants the team to show. For instance, if the team is a very high energy, pressing team the coach may want a Captain who demonstrate these qualities and who can lead by example with the high energy and pressing. 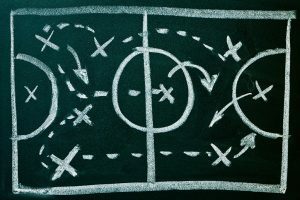 If the coach prefers to have a possession based team who look after the ball and build carefully and methodically up in their play, they may want a good, calm passer and someone who is comfortable in possession and brave enough to look for the ball at all times even when things are going badly, again leading by example but showing the qualities that the coach wants the team to show. The Captain will usually be the first to training and the last out, and will be working through the different training drills with the Coach. There has been some University research that Soccer managers regard their captains to be an extension of themselves, which might explain how some top soccer coaches do not react well if they are told who they can or cannot appoint as their skipper. There have been some notable examples in recent years of Manager’s becoming frustrated when they were prevented from giving their favored player the role of soccer Captain. This was particularly true of England National Team Manager Fabio Capello who was prevented from appointing his chosen player, Chelsea captain John Terry, as his Captain due to Terry’s off field behavior. The research set out to examine soccer managers’ perceptions and expectancies of leadership characteristics in team Captains. The research discovered that managers considered their Captains to be vital in their ability to carry out their management duties. They identified several disciplines they expected their team Captains to excel in. Also, there are a number of key leadership skills and characteristics that are shown up as being vital. Notice how these are skills the managers themselves must be outstanding in to be successful. Managers also stated that two standout leadership styles are important in their captains – either a highly aggressive approach or a technically skilled leader who inspires others through their own performance. A combination of both was ideal. So, if you harbor ambitions to be the Captain of your soccer team or you are a soccer coach who is agonizing over which of your players would make the best Captain for your team, you might want to consider who is the best fit with these characteristics when making your choice. For me personally, I think a Captain needs to be someone you look up to and respect, and who you turn to when you're in a hole and need to get out of it. 2 people I can think of personify this more than any others and that would be Roy Keane and Patrick Viera. Both of them hugely talented, but you wouldn't mess with either of them! What qualities does your Soccer Captain have? Can a Goalkeeper be a good Captain? Who do you think is the greatest Soccer Captain of all time?